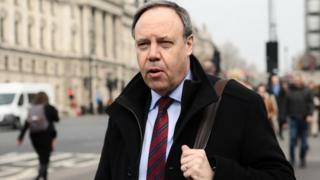 Image caption DUP deputy leader Nigel Dodds said that the party's role at Westminster "remains crucial"
The DUP will vote against the EU withdrawal agreement when it comes before the House of Commons later, its deputy leader has said. Nigel Dodds told BBC News NI he was not expecting "any last minute rabbits out of the hat" that would change the DUP's position. On Wednesday, the DUP said it would not back the prime minister's Brexit deal. "In this parliament our role remains crucial," Mr Dodds said. "Over 50% of Brexit votes have depended on the DUP so whatever happens, we are sticking to our votes on principle. "We will continue to do what we can to get the best votes for Northern Ireland." MPs will vote on the withdrawal agreement, covering the divorce bill, citizens' rights and the Irish backstop, but not the political declaration covering the UK's future relationship with the EU. Mr Dodds said the DUP is concerned about plans for "a trade border between Northern Ireland and the rest of the UK and what that would mean in terms of who makes our laws - not Stormont or Westminster". On Wednesday, the DUP said they could not support the deal despite Mrs May promising to step down if she received the backing of MPs. 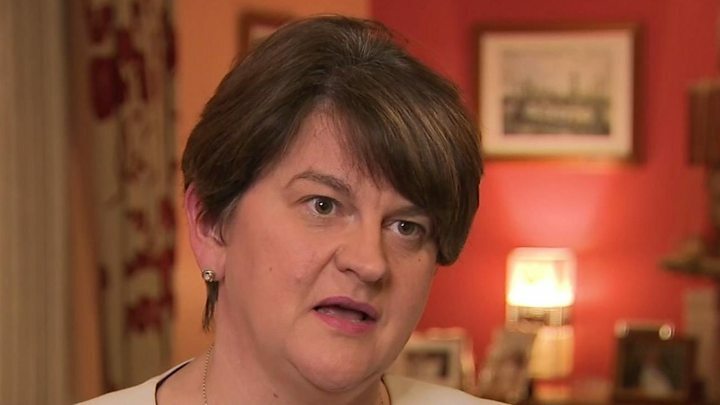 Party leader Arlene Foster said it "cannot sign up to something that would damage the union". He also rejected the notion the confidence-and-supply agreement has been fatally undermined. Mr Lidington, who is generally regarded as Theresa May's deputy, told BBC News NI that Conservatives and the DUP had held constructive discussions about domestic UK policy and legislation, and would continue to look at how their parliamentary arrangement can work better. He told a British Chamber of Commerce conference in London he is concerned about the impact a no-deal exit from the EU could have on the integrity of the UK. Asked whether this meant he is concerned about the prospect of a united Ireland, Mr Lidington said he believes moderate nationalists in Northern Ireland are unsettled due to a combination of Brexit and the political deadlock at Stormont. He pointed out that there is no longer an automatic unionist majority at Stormont and that Northern Ireland's position rests on the consent of moderate voters in the middle ground. Mr Lidington, who describes himself as a committed unionist, said the government needs to give everyone confidence that the UK union will work. Asked whether he is concerned about the impact of a no-deal Brexit on sections of the Northern Ireland economy, such as the agri-food sector, Mrs May's deputy noted that the EU had made no exemption for Ireland in its plans for customs and trade regulations in such a scenario. He said the UK would continue to talk to the Irish government and the EU Commission about strengthening contingency planning, but wanted to ensure a no-deal Brexit does not happen. Last weekend, some newspapers pointed to Mr Lidington as a potential caretaker prime minister. However, when asked if he would be a candidate for the Conservative leadership after Theresa May steps down, the he replied that "working closely with the prime minister cures you of any last remaining shred of ambition to fulfil that role".